Welcome to the Neopian Auction House! Here, you are able to buy items for fewer NeoPoints (or more) than you would in a normal shop or a user shop. The Auction House has a few pages that you'll need to learn how to use in order to use it well. The second page you need to know is the My Auctioned Items page. This page lists all of your auctions and your bidders. The third page you need to know is the My Bids page. This page lists all the auctions that you have placed a bid on. The fourth page you need to know is the Auction Genie page. You can search for items to bid on. 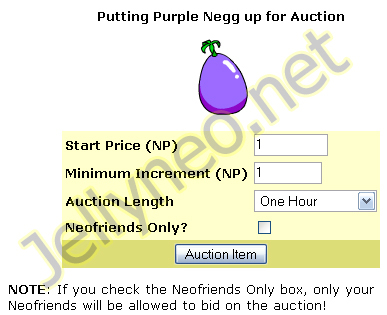 For example, searching for "Blue Draik Egg" (without quotes) will get you both Neofriend and non-Neofriend auctions. If you want JUST non-Neofriend auctions, check the box that says "Ignore Neofriend-only auctions" and you'll get non-Neofriend auctions. Under this is a box so you can also search for auctions by username. The final page you need to know is the Status page. This page is where you can tell if the Cron Jobs are dying. *points at Cronjobbia* Blame Cronjobbia if that happens. :P You can tell that the Cron Jobs are broken if the Average Wait Time turns to be over an hour (which is 60 minutes). When you're auctioning items, you have two text boxes to fill in and one drop-down to choose. One of those boxes is the Start Price. You should put that as your Final Price - Minimum Increment. (e.g. I want it to be 5,000 NP final. So to avoid other people bidding, I do a Minimum Increment of 4,000 NP. So 5,000 - 4,000 = 1000.) 1,000 NP would be your Start Price. The maximum starting price for an auction is 50 million NP. The second text box you need to fill in is the Minimum Increment box. That's how much your auction will increase by. So if your Increment was by 4,000 NP, people could bid up to 9,000 NP each time. The minimum increment cannot be more than the starting price. The only drop down you need to click on is the Auction Length. You can choose the following lengths: One Hour, Two Hours, Three Hours, Four Hours, Six Hours, Nine Hours, Twelve Hours, Eighteen Hours, One Day and Two Days. The final box is the "Neofriends Only?" box. Check that if you want your auction to be Neofriends only. Basically, nobody else can bid unless they're your Neofriend. You can have only eight items up for auction at a time, regardless of what they are or how long each auction is, so if you have a lot of items to sell, you'll need to use other methods (or just be patient as you wait for each set of eight to finish). When bidding on Auctions, you can bid 5,000 NP PLUS the Minimum Increment. Unlike the Trading Post, there is no limit on how much a user can bid. Like the Trading Post, your Neopoints are returned if your bid is unsuccessful. Rare Items such as Nerkmids, Laboratory Map pieces and other miscellaneous items often go for cheap.